Mardi Gras is the French phrase for Fat Tuesday, which refers to the day before the start of Lent. Many people practice eating rich foods and partying on the day before the ritual fasting that takes place during the season of Lent, which starts on Ash Wednesday. Planning a big splash for this special day can be a great way to celebrate. Mardi Gras is traditionally celebrated on Fat Tuesday, which falls in February or March. Since that is a typical workday for most people, it's sometimes easier to celebrate on a different day. Consider celebrating on the Friday or Saturday before Fat Tuesday. Once you decide on a date, send a Mardi Gras invitation to everyone on the guest list. Whether you are planning on a traditional Mardi Gras party or something else, a theme can help to determine the color scheme, menu, and other details for the party. 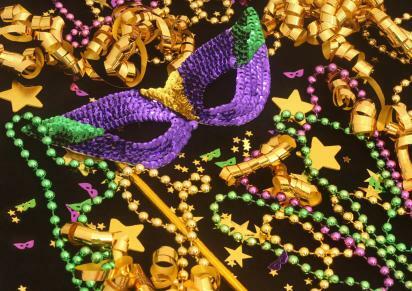 A traditional Mardi Gras party includes purple, gold, and green decorations, French and Louisiana-style foods, and traditional Mardi Gras costumes. Consider creating your own parade and walk the streets of your neighborhood. Don't forget the beaded necklaces! 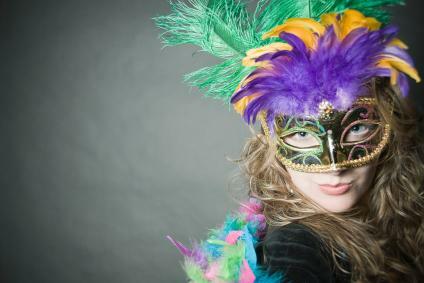 Purchase a masquerade costume or make a Mardi Gras costume yourself. Mardi Gras is rooted in France, so consider a French theme for your get-together. Decorate with French flags and serve French food favorites like French bread, cheese, wine and other foods inspired by the French. Decorate with images of the Eiffel Tower and other landmarks and teach guests a few key French phrases. Every good party consists of yummy traditional Mardi Gras foods. A full Mardi Gras party menu might include some Louisiana and French-inspired favorites like the following. Cajun: Cajun food is a Louisiana favorite. Consider serving Cajun-style rice, sausage, and seafood spiced with fresh black pepper and ground cayenne. 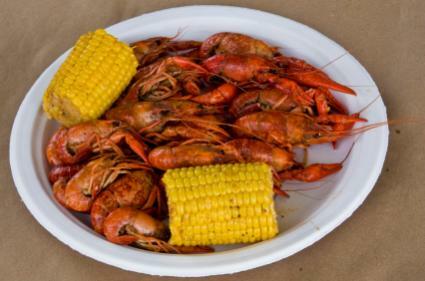 Seafood: Crawfish and other fish dishes are popular at Mardi Gras. Shrimp, mussels, and scallops along with rice and pasta dishes can also be served. Side Dishes: Okra, rice, and Jambalaya are perfect as main or as a side dish for a Mardi Gras party. These are great additions to a potluck as well. Alcoholic beverages are not in short supply at most Mardi Gras celebrations, and there are plenty of Mardi Gras drinks you can make for this special celebration. Also plan to serve rum, vodka, and cocktails mixed with fruit juices. Pecan pie is a yummy way to end a Mardi Gras meal. Crème brûlée is another appropriate dessert for a Mardi Gras celebration. No matter what type of party you choose to have, Mardi Gras decorations help set the mood, from beads to wreaths, flags, and more. Wall and ceiling hangings are good, but don't forget to add Mardi Gras centerpieces to all of your tables. Finally, be sure to tie all the decorations together by choosing coordinating Mardi Gras colors like green, gold, and purple. Every party should include some Mardi Gras games and activities to help entertain guests. Provide guests with plain masks which are available to purchase from craft and party stores. Also provide feathers, paints, stick-on jewels, beads and a variety of embellishments where guests can decorate their own masks. Alternatively, use a Mardi Gras mask template that is ready to print in full color and have guests add their own embellishments. Additional Mardi Gras craft ideas include making a King's Cake or your own poppers. Help guests remember the evening by having a table set up so they can create a Mardi Gras scrapbook page to take home and fill with photos after the party. Have Mardi Gras coloring pages available for the kids. Encourage guests to dress in Mardi Gras costumes and appoint a few judges. Award prizes for the best costumes. Have guests put on a parade so they can show off their attire. You don't have to live in New Orleans or France to have a fun Mardi Gras party. With some careful preparation and a group of friends, you too can celebrate Fat Tuesday the right way.